Leading design studios in the heart of London’s ‘Tech City’. Located in the heart of the ‘Silicon Roundabout East London Tech City’, we turned a derelict warehouse space into contemporary design studios for one of London’s most successful international theatre design studios. 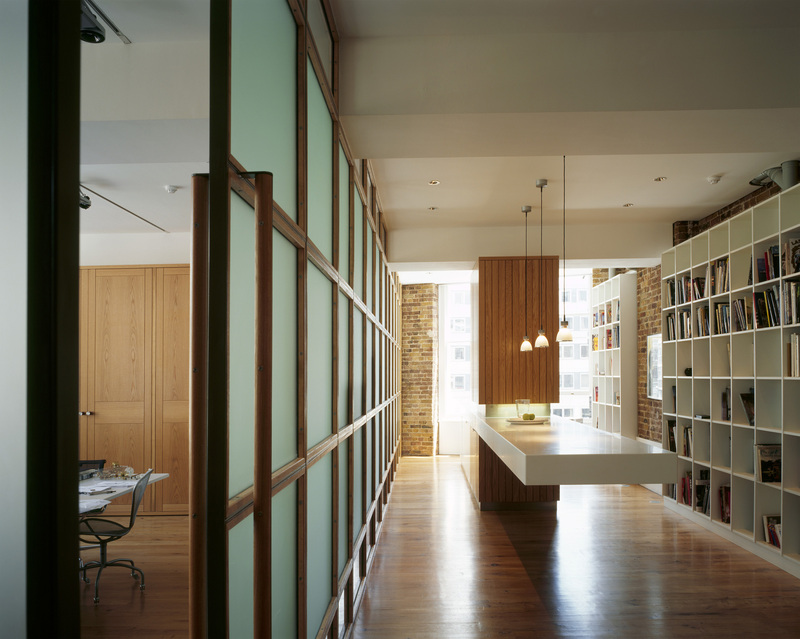 Bespoke furniture and fittings were designed and crafted for the project according to a spatial grid defined by the existing fenestration and brickwork piers. Floor-to-ceiling cupboards double as room dividers and concealed sliding doors enable the spaces to be free-flowing or divided into rooms when privacy is required. We used predominantly natural materials and supported authentic craftsmanship. While we value industrial manufacturing where it brings low cost results, we also believe in the importance of nurturing local inner-city craftsmanship, maintaining skills and providing vocational opportunities for young people with an interest in making things. The large hand-made screen that divides the recreation area from the offices is a homage to the screens in the Vyborg Library, Russia, right down to the smallest details of Alvar Aalto's masterpiece from 1934. We designed a range of door handles, hand-crafted in natural materials including oak, leather and steel. Reclaimed wooden floors came from French railway carriages and we used black knotting to emphasise the antique quality of the oak. This book contains essays that reveal the technical and creative secrets of Passive House design, as well as containing case studies of some of the world's best examples of beautiful, technically excellent buildings that still feel great even when the power supply is turned down to almost nothing.